As Libyan rebels fought to consolidate their hold on Tripoli on Monday and early Tuesday, reports emerged that two sons of Libya's longtime leader were free despite earlier reports that rebels had captured them. Saif al-Islam Gadhafi, son of Libyan leader Moammar Gadhafi, appeared to reporters in a convoy of armored Land Cruisers in Tripoli on Tuesday morning, more than a day after rebels claimed they had captured him. Hours earlier, Libya's ambassador to the United States said that one of Moammar Gadhafi's other sons, Mohammed Gadhafi, had escaped. [Updated at 11:39 p.m. ET, 5:39 a.m. Tuesday in Libya] Three surface-to-surface missiles were fired within Libya on Monday evening, NATO said in a statement. The alliance said it was not aware of damages or casualties. The missiles were fired from the area of Sirte, the hometown of Libyan ruler Moammar Gadhafi. Initial reports indicate they landed in the coastal area of Misrata, "most likely at sea or on the shore," NATO said. "The use of such missiles presents a direct threat to innocent people. Although the surface-to-surface missiles in (Gadhafi's) arsenal are highly inaccurate, and are not designed to hit a specific target, they are a weapon of terror. Their use against an urban or industrial area is utterly irresponsible," NATO said. [Updated at 8:56 p.m. ET, 2:56 a.m. Tuesday in Libya] CNN's Matthew Chance has posted a picture that he took of Saif al-Islam Gadhafi during Saif's brief visit to the Rixos Hotel on Tuesday morning. Chance also reports that electricity returned to the hotel about 10 minutes after Saif's visit. The building, where about 35 international journalists are staying, had been without power for hours. It's not yet known how many people have been killed or injured in Tripoli since rebels began fighting forces loyal to Gadhafi in the capital over the weekend. Video showed Saif al-Islam, son of Libyan leader Moammar Gadhafi and a top official in his regime, shaking hands and greeting supporters overnight while leaning outside of a car in his armored convoy on the streets of Tripoli. He told reporters that supporters of his father Moammar Gadhafi's government "have broken the spines of those rats and those gangsters" - referring to rebel fighters who entered the capital over the weekend. He said that on Tuesday the government's forces "will reassure the people that things are fine in Tripoli." Asked about his being wanted by the International Criminal Court - which has issued a warrant for his arrest for his alleged participation in "crimes against humanity" - Saif al-Islam Gadhafi said, "To hell with the ICC." Rebels had claimed that Saif al-Islam Gadhafi and two of his brothers were captured on Sunday and Monday. But Saif is free, and one of the other two, Mohammed Gadhafi, was reported to have escaped Monday, according to the Libyan ambassador to the United States. [Updated at 8:06 p.m. ET, 2:06 a.m. Tuesday in Libya] More from Saif al-Islam Gadhafi's appearance outside Tripoli's Rixos Hotel, more than a day after rebels reported they captured him: Saif said that word about his supposed detention was a rebel trick, CNN's Matthew Chance reports. Chance, who is with about 35 other journalists at the hotel, said an armored Land Cruiser pulled up to the hotel, and people were saying that Saif was inside. "It was just about to drive off, so I went up to it and I knocked on the window and said, 'Dr. Saif, Dr. Saif, can you open the door? We want to ... make sure it's you," Chance said. "He opened the door, turned the lights on inside the back of this armored land cruiser, and it was indeed him. He was bearded, he looked quite thin. ... He told me that his father, Col. Gadhafi, remained in Tripoli. He said the whole family are in Tripoli." Chance has posted this account of his encounter with Saif on Twitter: "Saif Gadhafi told me that he had been travelling around Tripoli in an armored convoy the whole time." Earlier, Libya's ambassador to the United States told CNN that another of Gadhafi's sons, Mohammad Gadhafi, had escaped from rebel custody. The circumstances of the escape were unclear, said Ambassador Ali Suleiman Aujali, an NTC representative. Rebels had said Saif al-Islam Gadhafi and Mohammad Gadhafi were among three of Moammar Gadhafi's sons that they had captured since Sunday. [Updated at 7:40 p.m. ET, 1:40 a.m. Tuesday in Libya] Moammar Gadhafi's son Saif al-Islam Gadhafi - who reportedly was captured by rebel forces on Sunday - made an appearance at Tripoli's Rixos Hotel early Tuesday, CNN's Matthew Chance reports. Saif appeared outside the hotel - one of the remaining hold-outs for Gadhafi loyalists - in a convoy of armored Land Cruisers. Chance said he spoke to Saif briefly and took a photo of him. Saif said his father and the rest of the family were in Tripoli, and that the rebels had been "lured into a trap." There was no immediate explanation from the National Transitional Council, the rebel leadership that had announced he was in custody on Sunday. [Updated at 6:35 p.m. ET, 12:35 a.m. Tuesday in Libya] CNN's Matthew Chance reports says he and the roughly 35 other journalists in Tripoli's Rixos Hotel - where they are essentially trapped, with Gadhafi loyalists refusing to let them leave as fighting rages outside - are running out of ways to keep in contact with people elsewhere, including their own employers. The hotel lost power hours ago, and the journalists - who have corralled themselves in the dark in a lobby on one of the upper floors - are running out of battery power for their phones and other equipment. Chance, whose own phones are dead, talked to CNN with a satellite phone lent by a Chinese television crew. Gunfire could still be heard outside the hotel, which is abandoned besides the journalists and gunmen loyal to Gadhafi. Fighting also appeared to happening around Gadhafi's compound near the hotel, Chance said. The journalists have found some canned food and bottled water in the hotel's storerooms and kitchen. "Hopefully we can ... negotiate some kind of exit from this hotel, because really we don't feel we're getting much in terms of an overall picture of what's happening in Tripoli." He said they're trying to stay away from the gunmen in the hotel, some of whom were cocking their guns and telling the reporters that they're NATO spies. [Updated at 6:21 p.m. ET, 12:21 a.m. Tuesday in Libya] Gadhafi's forces fired at least three missiles at the rebel-held city of Misrata, east of Tripoli, on Monday evening, the NATO alliance reported. NATO said it had no reports of damage or injuries, but called the launches a "direct threat to innocent people." "Although the surface-to-surface missiles in Gadhafi's arsenal are highly inaccurate, and are not designed to hit a specific target, they are a weapon of terror," NATO said. "Their use against an urban or industrial area is utterly irresponsible." [Updated at 5:50 p.m. ET, 11:50 p.m. in Libya] Mohammed Gadhafi - one of the three sons of the longtime Libyan leader who had been captured by rebel forces - has escaped, Libyan Ambassador Ali Suleiman Aujali told CNN. The ambassador told CNN's Wolf Blitzer that after rebels found Mohammad Gadhafi at his home, he was allowed to stay there at his request. Later, Mohammad Gadhafi was "hijacked" by a different group, "maybe Gadhafi's forces," the ambassador said. "We don't know the story how he was taken out from his house," he said. [Updated at 5:02 p.m. ET, 11:02 p.m. in Libya] With rebels apparently on the verge of taking Tripoli, politicians in the United States and the United Kingdom are demanding that they extradite convicted Lockerbie bomber Abdel Basset al-Megrahi when the rebels establish control over the country, CNN's Tim Lister reports. There has been no formal response from the rebels' National Transitional Council, but one of its representatives has previously suggested that any decision on al-Megrahi's future would have to wait for an elected government in Libya. On the NTC's own timetable that would be almost two years away. Al-Megrahi was released from the jail on compassionate grounds in 2009 after serving eight years of a 27-year sentence for his involvement in the bombing of Pan Am Flight 103 in December 1988 over Lockerbie, Scotland. He is suffering from prostate cancer and at the time of his release was given just three months to live. But two years later he is still alive and was last known to be living in Tripoli, now largely under rebel control. [Updated at 4:52 p.m. ET, 10:52 p.m. in Libya] The U.S. and NATO have been quietly talking to National Transitional Council officials for the last several weeks about securing Libya's remaining stockpiles of mustard gas and other weapons material in the event the Gadhafi regime fell, U.S. officials say, according to CNN's Barbara Starr. "The opposition forces are being asked to keep track of what's going on" with both weapons of mass destruction (WMD) and the regime's inventory of surface-to-air missiles, a NATO official said. The official also confirmed that intelligence personnel from the U.S. and other countries have been in Libya in recent weeks to help maintain security at various sites, although he could not confirm Western personnel are currently at those locations. "Individual nations have folks on the ground," he said. [Updated at 4:19 p.m. ET, 10:19 p.m. in Libya] U.S. President Barack Obama and British Prime Minister David Cameron spoke Monday about Libya and "agreed that the situation had reached a tipping point and that (Libyan leader Moammar Gadhafi) needed to relinquish power once and for all," according to a statement from the White House. "At the same time, they agreed to continue to work with allies and partners in the international community to protect the people of Libya and to support a peaceful transition to democracy," the statement said. "The prime minister joined the president in urging the (Libyan rebels') Transitional National Council to continue demonstrating its leadership by respecting the rights of the people of Libya, avoiding civilian casualties, protecting the institutions of the Libyan state, and pursuing a transition to democracy that is just and inclusive for all of the people of Libya." [Updated at 3:18 p.m. ET, 9:18 p.m. in Libya] More from U.S. President Barack Obama's comments on Libya this afternoon: He stressed that the battle there "was not over yet," and called on Moammar Gadhafi to surrender and tell his supporters to lay down their arms. "Although it's clear that Gadhafi's rule is over, he still has the opportunity to reduce further bloodshed," he said. [Updated at 2:20 p.m. ET, 8:20 p.m. in Libya] The situation in Libya "is still very fluid," U.S. President Barack Obama said Monday. "There remains a degree of uncertainty and there are still regime elements who pose a threat," he said in taped remarks. "But this much is clear. The Gadhafi regime is coming to an end and the future of Libya is in the hands of its people." [Updated at 2:17 p.m. ET, 8:17 p.m. in Libya] CNN's Matthew Chance (@mchancecnn) tweets an update on his situation in the Rixos Hotel where fighting has been ongoing. "On bright side, am with excellent group of journalists at #Rixos. We are feeling our way around corridors with candles. No power." [Updated at 2:10 p.m. ET, 8:10 p.m. in Libya] The U.S. State Department is "focused like a laser" on the issue of getting funding to the rebels' National Transitional Council, department spokeswoman Victorial Nuland said Monday. Nuland did not specify how much money could be provided, but said it would go toward "humanitarian needs" and "maintenance of essential services. "Nuland declined to detail any U.S. intelligence reporting on Gadhafi's whereabouts. "Like you, we've noticed that he hasn't been seen in public in quite some time. ... If he is alive, the best thing he can do for his people is step down immediately and end this," she said. Opposition forces had control of about 90% of Tripoli Monday, but fighting continued, Nuland said. [Updated at 2:07 p.m. ET, 8:07 p.m. in Libya] CNN's Sara Sidner is reporting that rebels who were surprised at how quickly they were able to get into Tripoli are now turning their focus on how to secure the city. "We're standing around today looking at each other wondering how did this happen so fast, even the rebels themselves," she said. Now, the rebels say their focus is finding Moammar Gadhafi and the faces of his regime, Sidner reported. "[The rebels believe that [Gadhafi] is somewhere in Tripol," Sidner said. "At a time like this when there's general chaos .... there are rumors going all over the place. They believe he is either in the city or very close to the city. So everyone is a little tense about exactly where he is." Sidner said as the rebels work within the city they plan to start detaining people in an effort to start their own kind of justice system for those in Gadhafi's regime. [Updated at 2:01 p.m. ET, 8:01 p.m. in Libya] The United Nations' top refugee official called Monday for the protection of foreigners in Tripoli and other areas where fighting is ongoing in Libya. "It is crucial that humanitarian law prevails through these climactic moments and that foreigners - including refugees and migrant workers - are being fully and properly protected from harm," said Antonio Guterres, the U.N. high commissioner for refugees. [Updated at 1:39 p.m. ET, 7:39 p.m. in Libya] President Barack Obama will meet with his National Security Council on Monday afternoon to discuss the situation in Libya, a White House official said. [Updated at 1:28 p.m. ET, 7:28 p.m. in Libya] President Barack Obama will tape a statement on Libya at 2 p.m. ET, the White House announced Monday. [Updated at 1:11 p.m. ET, 7:11 p.m. in Libya] CNN's Matthew Chance, who is inside the Rixos Hotel, said he and other journalists have barricaded themselves as gunmen roam the hotel. "We're quite spooked," he said. Libyan troops are keeping the reporters on lockdown, Chance said. Chance had earlier reported that there was fresh and heavy gunfire outside the hotel, which is near the Gadhafi compound and one of the few remaining strongholds of the longtime leader of Libya. "We moved out because … we don’t know exactly where those snipers are," she said. Sidner, who moved towards a coastal road that brings supplies into Tripoli, said that the situation was still unstable in some areas. "You never know when you're going to turn a corner and find a tank" in Tripoli, she added. Rebels waived flags and shot into the air behind Sidner and she reported live on CNN. @mchancecnn: "It's no fun being stuck in one of #Gadhafi's few remaining strongholds. #Rixos gunmen now refusing to let us leave." @mchancecnn: "Fierce battle under way near #Gadhafi compound. Huge explosions, heavy machine-gun fire. #Rixos getting hit by stray bullets." [Updated at 12:34 p.m. ET, 6:34 p.m. in Libya] CNN's Matthew Chance is reporting that ferocious fighting has broken out near the Rixos Hotel where journalists are staying in Tripoli. Chance described hearing heavy explosions and artillery shelling. "It is ongoing and it's not just a firefight, we're talking about heavy explosions," he said. "This is a huge, all-out battle for control." Chance said the situation has gotten even more difficult for journalists as the generators are out of fuel and electricity is out at the hotel. He said the symbolic nature of the hotel as well as the proximity to Gadhafi's compound is likely why the fighting is happening in that area specifically. “While there are pockets of rebel control, this is one pocket which remains firmly in the hands of the Gadhafi loyalists," Chance said. He tweeted: (@mchancecnn) "All electricity down, running low on food and water. Sitting at #Rixos in the dark as bullets fly outside." He added, "Mood in Rixos much darker than before. Everyone really worried about what's going to happen to us." [Updated at 12:24 p.m. ET, 6:24 p.m. in Libya] CNN's Matthew Chance reports there is intense fighting and gunfire near the Rixos Hotel where he and other international reporters are staying in Tripoli. [Updated at 11:26 a.m. ET, 5:26 p.m. in Libya] United Nations officials have unsuccessfully tried to reach Moammar Gadhafi, U.N. Secretary-General Ban Ki-moon told reporters Monday. "We've been trying to get in touch with him, and I also myself tried to speak with him recently, but as you may expect and understand ... it has not been possible," Ban said, adding that he did not know Gadhafi's whereabouts. The U.N. chief described events in Tripoli as "testimony to the courage and determination of the Libyan people to seek a free and democratic future." "It is crucial now for the conflict to end with no further loss of life," he added. Ban said he plans to hold an urgent high-level meeting this week to discuss the situation with several regional organizations, including the African Union, the League of Arab States and the European Union. "This is a hopeful moment but also there are risks ahead. Now is the time for all Libyans to focus on national unity, reconciliation and inclusiveness," he said. [Updated at 11:21 a.m. ET, 5:21 p.m. in Libya] Pentagon Spokesman Col. David Lapan says they believe leader Moammar Ghadafi is still in Libya. "We do not have information he left the country," Lapan said. [Updated at 11:21 a.m. ET, 5:21 p.m. in Libya] The chief prosecutor of the International Criminal Court spoke with authorities from the rebels' National Transitional Council Monday, the court said in a statement. The council "explained the efforts to stabilize the situation in Tripoli," the statement said. Future conversations with Libyan authorities will determine how cases will proceed against Libyan leader Moammar Gadhafi, his son Saif al-Islam Gadhafi and his brother-in-law Abdullah al-Sanussi, the court said. The court, based in The Hague, Netherlands, issued arrest warrants for the men earlier this summer. [Updated at 11:08 a.m. ET, 5:08 p.m. in Libya] Mustafa Abdul Jalil, the chair of Libya's transitional council, said he does not know where Moammar Gadhafi is but that they hope to find him alive and bring him to trial. "I have no idea how he will defend himself against these crimes that he committed against the Libyan people and the world," he said. "The real moment of victory is when Ghadafi is captured." A former Gadhafi interpreter told CNN that based on the nine years that he worked with the Libyan leader he expects him to fight until the end. "I know he is not going to surrender," Abubaker Saad told CNN. " He is not the type to surrender." [Updated at 11:01 a.m. ET, 5:01 p.m. in Libya] A Russian official urged NATO countries and forces on both sides battling in Libya Monday to follow international law and avoid harming civilians and infrastructure. "We hope that restraining signals will be sent both to supporters of Moammar Gadhafi and the opposition forces by the states and international organizations that have influence over them," said Konstantin Dolgov, the Russian Foreign Ministry's ombudsman for human rights, democracy and rule of law. [Updated at 10:52 a.m. ET, 4:52 p.m. in Libya] Egypt has recognized the National Transitional Council as the only political representative of the Libyan people, the state-owned MENA news agency of Egypt reported, citing a statement from Egyptian Foreign Minister Mohamed Kamel. [Updated at 10:43 a.m. ET, 4:43 p.m. in Libya] Libyan rebels said Monday that they had taken control of the country's state television network. Rebel TV reported that rebels had taken control of the station. The Libyan state network was broadcasting a black screen. In a telephone interview from Cairo Assistant Secretary of State for Near Eastern Affairs Jeffrey Feltman said that, until Saturday night, six officials with whom the U.S. had previous contact were still trying to reach out to the Obama administration but were taking a “defiant” approach, saying they were ready to negotiate but it would not be about Gadhafi leaving. “I think they were looking for a way to find a lifeline, buy time, to prevent what was then becoming inevitable, which was the uprising in Tripoli,” he said. [Updated at 10:13 a.m. ET, 4:13 p.m. in Libya] CNN's Sara Sidner described the scene just outside the capital as rebels regroup before heading back into Tripoli: Rebels are on the outskirts of the capital and there are a lot of men walking around with guns and ammunition. There are pickup trucks with guns welded into them that continue to pour into the area. "They’re all gathering to do something … we don’t know when its going to happen," Sidner said. "We expect they are going to try to go into the city and do a street-by-street sweep." Sidner said there is a continuous stream of rebels continuing to come in from the west of the city. She added that rebels know coordination is key during this stage of the battle for Libya. "A lot of these people don’t know each other," she said, noting many are just regular people. " They want to fight against the regime, but they have to do it in a coordinated way." She added it was unclear where the coordination was coming from but there was clearly some kind of instructions being handed down. As the battle rages on CNN's Nic Robertson and Paul Armstrong take a look at whether it is too early to celebrate a rebel triumph. [Updated at 9:29 a.m. ET, 3:29 p.m. in Libya] Libyan rebels say they have detained a Libyan state television anchor who brandished a weapon on air and pledged to fight for Moammar Gadhafi. Over the weekend, anchor Hala Misrati grabbed a handgun from the top of the anchor desk as news reports said that rebels were advancing toward the Libyan capital of Tripoli. She warned rebels trying to oust Gadhafi that staffers at government-run al-Libiyah would become martyrs if they had to. [Updated at 9:24 a.m. ET, 3:24 p.m. in Libya] Rebel commanders told CNN's Sara Sidner they are working on a systematic and coordinated push to make sure they have control of the entire capital of Tripoli. Sidner said that in Tripoli she is not seeing large number of pro-Gadhafi troops. "Everyone was expecting thousands of members of Gadhafi's army to fortify where the stronghold and compound is," Sidner said. Sidner said one rebel told her they were surprised to have not seen large tanks. People are wondering where the thousands of expected troops supporting Gadhafi are, or whether the "last stand" argument by Gadhafi was just an attempt to scare rebels. [Updated at 9:19 a.m. ET, 3:19 p.m. in Libya] "The latest dramatic development of the Libyan conflict apparently shows that the power in this country will be handed over to the rebel forces very soon. We hope that this will put an end to the protracted intra-Libyan bloodshed, which brought so many woes and so much suffering to this country's population and caused serious damage to the national economy," the Russian Foreign Ministry said in a statement. [Updated at 9:12 a.m. ET, 3:12 p.m. in Libya] Rebels do not know whether Moammar Gadhafi is inside Libya, the head of the rebels' National Transitional Council said Monday. "The real moment of victory is when Gadhafi is captured," Mustafa Abdul Jalil, the council's chairman, said. [Updated at 9:09 a.m. ET, 3:09 p.m. in Libya] U.S. and NATO officials say they remain concerned that forces loyal to Moammar Gadhafi in Tripoli still might be able to stage a last ditch attack aimed at Libyan civilians. “If there is a last ditch effort we want to protect civilians,” said a senior NATO official speaking on condition of anonymity because of sensitive intelligence matters. The official said NATO is watching closely for any sign of a massing of Libyan government forces, or moving of weapons such as rockets or artillery. Striking such targets in the heavily populated areas of Tripoli could be a difficult problem because rebel forces, civilians and loyalists are mixed in among the entire population, he said. [Updated at 8:54 a.m. ET, 2:54 p.m. in Libya] The U.S. was able to spearhead the imminent collapse of Moammar Gaddfi's regime in Libya on the cheap, writes Mark Thompson on TIME.com, using NATO to handle most of the war-fighting burden. And NATO Secretary General Anders Fogh Rasmussen thinks the Libyan operation could act as a blueprint for a less U.S.-centric way of waging war. Read the TIME blog. [Updated at 8:21 a.m. ET, 2:21 p.m. in Libya] Oil prices were mixed Monday as Moammar Gadhafi's regime appeared to be closer to tottering on the brink of defeat. Brent oil, which is tied to the European market, dropped 1% to $107.55 a barrel, while U.S. crude prices rose more than 1% to $83.46 a barrel. The disparity between the two prices is due to the fact that Brent will feel the more immediate impact from Libyan oil coming back online, whereas U.S. prices are more insulated. CNNMoney reports. [Updated at 8:20 a.m. ET, 2:20 p.m. in Libya] The International Organization for Migration sent a boat to Tripoli Monday to evacuate stranded migrants in the Libyan capital. The boat, which can carry 300 people, left the Libyan city of Benghazi Monday morning, the organization said in a statement. It is scheduled to arrive in Tripoli Tuesday, the organization said. [Updated at 8:10 a.m. ET, 2:10 p.m. in Libya] French President Nicolas Sarkozy sharply criticized Moammar Gadhafi Monday, saying the Libyan leader's calls to continue fighting were "desperate and irresponsible." "While the developments of the military situation on the ground and the many defections taking place in (Gadhafi's) camp confirm that the end of Gadhafi and his regime is now inevitable and near, the president condemns in the strongest terms the desperate and irresponsible calls of Colonel Gadhafi to continue fighting at all costs," Sarkozy's office said in a statement. [Updated at 8:03 a.m. ET, 2:03 p.m. in Libya] Rebels on Monday afternoon pulled back from an area near Green Square - which rebels are renaming Martyrs' Square - to coordinate some sort of offensive in the city, although it was not immediately clear what they were planning. Gadhafi's regime remained in control of at least three sites in the city - a hospital, a military barracks and the Rixos hotel, where international journalists are staying, said Guma El-Gamaty, the Britain-based coordinator for the rebels' Transitional National Council. [Updated at 7:56 a.m. ET, 1:56 p.m. in Libya] The Libyan Embassy in Damascus, Syria, declared Monday that it was siding with the rebels' Transitional National Council government. "What is happening in Libya today is the re-writing of the history of this country all over again through a revolution that has been baptized by the blood of its youth, and history will not forgive those who do not participate or support this great event that will not be repeated in Libya's modern history," the ambassador and staff of the embassy said in a statement. [Updated at 7:43 a.m. ET, 1:43 p.m. in Libya] Rebel forces half a mile from Tripoli's Green Square began pulling back Monday after facing heavy resistance in the Libyan capital from troops loyal to Moammar Gadhafi. [Updated at 7:26 a.m. ET, 1:26 p.m. in Libya] Italian Foreign Minister Franco Frattini told Italy's Radio Rai radio Monday morning that Moammar Gadhafi's forces controlled only 10% to 15% of the capital city of Tripoli. "The rest is in the hands of the rebels," he said. [Updated at 7:15 a.m. ET, 1:15 p.m. in Libya] Prime Minister David Cameron said Monday that Britain will "soon release" frozen Libyan assets to help support the rebel government. "At the UN, we will ... be taking early action in the Security Council to give the new Libyan authorities the legal, diplomatic, political and financial support they need," Cameron said. "We will soon be able to release the frozen assets that belong to the Libyan people." [Updated at 7:12 a.m. ET, 1:12 p.m. in Libya] Libyan leader Moammar Gadhafi must surrender, Italian Foreign Minister Franco Frattini said Monday. "Time is up. There are no alternatives to his surrender. If Gadhafi keeps calling for a civil war, he will be considered the only one responsible for the bloodbath," Frattini said in an interview with Italian news channel Sky Tg24. [Updated at 6:22 a.m. ET, 12:22 p.m. in Libya] British Prime Minister David Cameron says the regime of Libyan leader Moammar Gadhafi is falling apart and in full retreat. [Updated at 6:12 a.m. ET, 12:12 p.m. in Libya] Mahmoud Jibril, the head of Libya's Transitional National Council, is expected to travel to Paris in the coming days to meet with French President Nicolas Sarkozy, France's minister of foreign and European affairs, Alain Juppe, said Monday. The anticipated visit follows a scheduled telephone conversation between the two men on Monday, Juppe said. [Updated at 6:06 a.m. ET, 12:06 p.m. in Libya] Rebel fighters are clashing with forces loyal to Moammar Gadhafi near the Rixos Hotel, one of the remaining Gadhafi strongholds in Tripoli, according to a report Monday by CNN's Matthew Chance, who is at the hotel. The hotel, where CNN and other international journalists have been staying, is near Gadhafi's compound where fierce fighting is also raging between rebels and Gadhafi's forces, Chance said. [Updated at 6:03 a.m. ET, 12:03 p.m. in Libya] Since NATO began operations in Libya on March 31, it has conducted a total of 19,877 sorties, including 7,505 strike sorties. NATO is operating under a U.N. Security Council resolution authorizing the use of force to protect Libyan civilians. [Updated at 5:48 a.m. ET, 11:48 a.m. in Libya] A rebel field commander told CNN Monday that fighters from Libya's western mountains were deployed to the country's northern coastal road, the main thoroughfare to Tunisia, to cut off the last of Moammar Gadhafi's forces in the region. [Updated at 5:43 a.m. ET, 11:43 a.m. in Libya] South Africa's foreign affairs minister, Maite Nkoana Mashabane, told CNN Monday that there are no plans to send planes to Libya to evacuate Moammar Gadhafi or his family. "I'm actually amazed that there is even an insinuation that we are facilitating the exit of anyone because I know for sure that there was never ever such a request," Mashabane later told reporters. "So we are amazed that there is this insistence that we will be evacuating people out of the country." Mashabane said the position of South Africa and the African Union with regard to Libya has been clear. "We have been saying consistently as the AU the solutions of the political problems of Libya should be made by Libyans themselves," Mashabane said. [Updated at 4:48 a.m. ET, 10:48 a.m. in Libya] China is weighing in as Libyan rebels appear to be moving ever closer to toppling Moammar Gadhafi's 42-year rule. Ma Zhaoxu, Foreign Ministry spokesman: "We've noticed the development in Libya. China respects the choice of Libya people. China hopes the situation in Libya gets stabilized as soon as possible and people can live a normal life there. China is willing to cooperate with the international society to play a positive role in the future reconstruction of Libya." Here's a wrap-up of world leaders reactions. [Updated at 4:48 a.m. ET, 10:48 a.m. in Libya] Dr. Norri Armeli, who has helped organize a civilian hospital near Libyan leader Moammar Gadhafi's home, told CNN Monday that he has heard the sound of heavy clashes in the area, including shelling, near the Bab Al Aziza compound. Meanwhile, Gadhafi's forces in one Tripoli neighborhood are negotiating their surrender with rebels, said Jumma Ibrahim, a rebel military spokesman. Ibrahim said the negotiations were occurring in the Tajoura neighborhood, one of the three areas in the Libyan capital where Gadhafi's forces remained in control. The neighborhood is home to a cardiac hospital, where Gadhafi's forces are asking to surrender, Ibrahim said. [Updated at 4:29 a.m. ET, 10:29 a.m. in Libya] French President Nicolas Sarkozy called on Moammar Gadhafi to "avoid inflicting futile sufferings on his people" and order forces still loyal to him to lay down their weapons, according to a statement released Monday. Sarkozy also praised the opposition and pledged France's full support to liberate the country, the statement said. [Updated at 4:04 a.m. ET, 10:04 a.m. in Libya] There's been a bit of Internet buzz/rumors of Moammar Gadhafi possibly seeking safe transport to South Africa. South Africa's foreign affairs minister, Maite Nkoana Mashabane, told CNN Monday that there are no plans to send planes to Libya to evacuate Moammar Gadhafi or his family. Gadhafi's whereabouts are still unknown. Guma El-Gamaty, a Britain-based coordinator for the Transitional National Council told CNN the opposition believes that Gadhafi is either hiding in Tripoli, has fled to southern Libya or fled to neighboring Chad or Algeria. "Those are the only two neighboring country that have been showing support for him," El-Gamaty said. [Updated at 3:32 a.m. ET, 9:32 a.m. in Libya] A quick recap of what rebel leaders are saying about embattled Libyan leader Moammar Gadhafi's sons. Rebels claim three sons - Saif al-Islam, Saadi and Mohammed - were captured during their siege of Tripoli. "As for the other four sons, we think they are either hiding or they have run away," said Guma El-Gamaty, the Britain-based coordinator for Libya's Transitional National Council. [Updated at 3:15 a.m. ET, 9:15 a.m. in Libya] Guma El-Gamaty, the Britain-based coordinator for Libya's Transitional National Council, told CNN on Monday that "a great majority of the capital of Tripoli is under freedom fighters' control." [Updated at 3:01 a.m. ET, 9:01 a.m. in Libya] More international reaction, this time from Venezuelan President Hugo Chavez, who blasted NATO and the U.S. in a speech to supporters Sunday for "practically demolishing Tripoli with their bombs." Chavez told supporters that NATO and the United States were bombing the Libyan capital "because they feel like it." "Today they dropped I don't know how many bombs, and they are dropping them indiscriminately and openly," he said. [Updated at 2:35 a.m. ET, 8:35 a.m. in Libya] Britain's Prime Minister David Cameron is calling on Moammar Gadhafi to step down to avoid further bloodshed, according to a statement posted on the minister's website late Sunday. "It is clear from the scenes we are witnessing in Tripoli that the end is near for Gadhafi," the statement said. It also said: "He has committed appalling crimes against the people of Libya and he must go now to avoid any further suffering for his own people." [Updated at 2:17 a.m. ET, 8:17 a.m. in Libya] New details have emerged about a live telephone interview on Al Jazeera that purports to be with Mohammed Gadhafi – one of Colonel Moammar Gadhafi’s sons. During the call, gunfire could be heard and Mohammed Gadhafi uttered a declaration of Muslim faith that is given when one believes death is approaching. "I'm being attacked right now. This is gunfire inside my house. They are inside my house," Gadhafi told the station. Heavy gunfire was heard again and then the phone call was abruptly cut off. Later, the head of the Transitional National Council told the station that Mohammed Gadhafi was not harmed. Al Jazeera reports that during the exchange of gunfire between rebels and Gadhafi's guards, one of his guards was harmed and a rebel fighter killed. The Al Jazeera anchor then reported that according to the Chairman of the Transitional National Council Mustafa Abdul Jalil speaking to Al Jazeera, Mohammed Gadhafi and his family ‘have not been harmed, but their movements are under the control of rebel forces’. From CNN Producer Jomana Karadsheh in Tripoli: CNN Team hearing sounds of sporadic gunfire and explosions coming from the direction of Libyan Leader Muammar Gadhafi’s compound in Tripoli, Bab Al Azizya. Much of Bab al-Aziziya has been destroyed by NATO airstrikes, and a fight for the compound might be more symbolic in nature. An unidentified resident of Tripoli tells CNN's Jonathan Mann that she is cautiously rejoicing. She calls the rebel advance on Tripoli and apparent downfall of the Gadhafi regime as "a dream come true." Gunshots can be heard in the background. It's unclear if it is fighting or celebratory fire. "It's still not safe for women to go out," she said. [Updated at 1:25 a.m. ET, 7:25 a.m. in Libya] Ali Suleiman Aujali, the Libyan rebel government's ambassador to the United States, told CNN Monday that the Transitional National Council is ready to move to Tripoli. "TNC is going to run the country. They will move to Tripoli as soon as possible," he said. "Of course they have to take care of the security of the city and, of course, our concern now is where is Gadhafi. We have to find out where is he." He also told CNN he believes the Libyan people should decide whether to hand over Gadhafi's sons to the International Criminal Court. [Updated at 1:01 a.m. ET, 7:01 a.m. in Libya] CNN producer Jomana Karadsheh tweets that gun fire can be heard nearby the Rixos hotel, where she and other international press are staying. Follow this Twitter list of CNN boots on the ground in Libya including @sarasidnercnn @mchancecnn @jomanacnn as well as CNN producers and correspondents following the developments. [Updated at 12:51 a.m. ET, 6:51 a.m. in Libya] Ali Suleiman Aujali, the Libyan Transitional National Council ambassador to the United States, told CNN early Monday that Gadhafi brigades have raised the white flag in al-Brega. "Libya is under the control of the TNC," he said. CNN could not independently confirm his claim. [Updated at 12:28 a.m. ET, 6:28 a.m. in Libya] The head of the Transitional National Council tells Al Jazeera that Mohammed Gadhafi, another son of the embattled Libyan dictator, was not harmed. [Updated at 11:24 p.m. ET, 5:24 a.m. Monday in Libya] Among the scores of rebel fighters who advanced on Tripoli are members of the "Tripoli Brigade," a group of rebel troops who'd once lived in the capital who might help navigate the city, reports Sara Sidner. But they weren't all professional soldiers, such as one IT worker who hadn't held a gun before joining the movement a few months ago. [Updated at 10:21 p.m. ET, 4:21 a.m. Monday in Libya] U.S. President Barack Obama has said "the momentum against the Gadhafi regime has reached a tipping point." "Tripoli is slipping from the grasp of a tyrant," Obama said in a statement released by the White House on Sunday night. 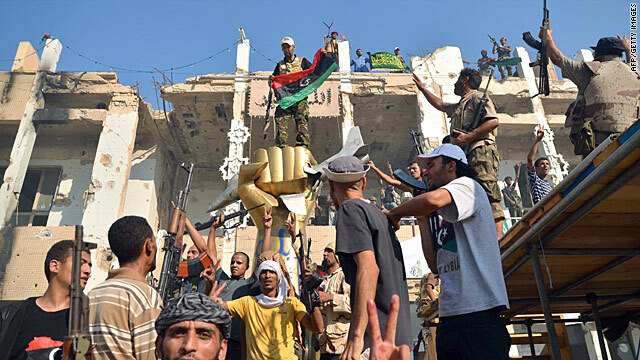 "The Gadhafi regime is showing signs of collapsing. The people of Libya are showing that the universal pursuit of dignity and freedom is far stronger than the iron fist of a dictator. "The surest way for the bloodshed to end is simple: Moammar Gadhafi and his regime need to recognize that their rule has come to an end. Gadhafi needs to acknowledge the reality that he no longer controls Libya. He needs to relinquish power once and for all. Meanwhile, the United States has recognized the Transitional National Council as the legitimate governing authority in Libya. "At this pivotal and historic time, the TNC should continue to demonstrate the leadership that is necessary to steer the country through a transition by respecting the rights of the people of Libya, avoiding civilian casualties, protecting the institutions of the Libyan state, and pursuing a transition to democracy that is just and inclusive for all of the people of Libya. A season of conflict must lead to one of peace. "The future of Libya is now in the hands of the Libyan people. Going forward, the United States will continue to stay in close coordination with the TNC. We will continue to insist that the basic rights of the Libyan people are respected. And we will continue to work with our allies and partners in the international community to protect the people of Libya, and to support a peaceful transition to democracy." [Updated at 10:14p.m. ET, 4:14 a.m. Monday in Libya] Opposition forces said early Monday that forces loyal to Libyan leader Moammar Gadhafi could be planning to re-enter Tripoli's Green Square, where scores of rebel fighters had gathered. CNN could not independently confirm the claim. [Updated at 10:09 p.m. ET, 4:09 a.m. Monday in Libya] A CNN iReporter captured video of a massive celebration in Freedom Square at the rebel stronghold of Benghazi, Libya. [Updated at 9:20 p.m. ET, 3:20 a.m. Monday in Libya] The route heading to Tripoli's Green Square - where scores of rebel fighters had gathered early Monday - was "eerily quiet," with cars passing by checkpoints run by those loyal to the opposition, CNN's Sara Sidner reported. [Updated at 9:09 p.m. ET, 3:09 a.m. Monday in Libya] Scores of rebel fighters gathered Monday morning in Tripoli's Green Square, the same place where supporters of Moammar Gadhafi had congregated for months, CNN's Sara Sidner reported. Celebratory gunfire rung out around the square, though rebels warned that snipers may still be in the area. [Updated at 9:05 p.m. ET, 3:05 a.m. Monday in Libya] U.S. President Barack Obama has said he'll make a statement about Libya when his administration gets full confirmation of what is happening there. [Updated at 8:57 p.m. ET, 2:57 a.m. Monday in Libya] The International Criminal Court will hold talks Monday with Libyan rebels on transferring Saif al-Islam Gadhafi, one of the two captured sons of embattled Libyan strongman Moammar Gadhafi, to its custody, Chief Prosecutor Luis Moreno-Ocampo told CNN. Moreno-Ocampo said the younger Gadhafi's arrest was "very important" for the war-crimes court, which issued a warrant for his arrest in June on charges of crimes against humanity. "We'll discuss tomorrow the transition of authority, how to manage to surrender him," Moreno-Ocampo said. Saif al-Islam Gadhafi is wanted for crimes against humanity in connection with attempts to put down the revolt against his father's four-decade rule in February. [Updated at 8:19 p.m. ET, 2:19 a.m. Monday in Libya] Pictures are beginning to emerge early Monday from Tripoli's Green Square, where Col. Moammar Gadhafi's supporters had been gathering regularly, showing those opposed to the regime celebrating the rebel fighters' inroads. Joyous people could be seen celebrating, waving the rebel flag and even flashing the "victory" sign. [Updated at 7:33 p.m. ET, 1:33 a.m. Monday in Libya] The International Criminal Court will hold talks with Libyan rebels on transferring Saif al-Islam Gadhafi, one of the two captured sons of embattled Libyan strongman Moammar Gadhafi to its custody, Chief Prosecutor Luis Moreno-Ocampo tells CNN. [Updated at 6:38 p.m. ET, 12:38 a.m. Monday in Libya] A rebel spokesman in Libya said Monday that rebels are in control of most parts of the capital. "The rebel fighters are in control of most of the neighborhoods in Tripoli," said Jumma Ibrahim, adding that fighters have made it to the city's Green Square. [Updated at 6:36 p.m. ET, 12:36 a.m. Monday in Libya] A second son of embattled Libyan strongman Moammar Gadhafi, Saadi Gadhafi, has been captured by rebel forces moving into Tripoli, a rebel military spokesman told CNN early Monday. The news comes about an hour after the rebels claimed they captured one of Moammar Gadhafi's other sons, Saif al-Islam Gadhafi. Saadi Gadhafi, a businessman and onetime professional soccer player, helped set up an April CNN interview with a woman who claimed she had been raped by government troops. He later told CNN that the people behind the attack should be prosecuted. [Updated at 5:54 p.m. ET, 11:54 p.m. in Libya] Libyan leader Moammar Gadhafi has called on Libyan Arab tribes to come to the defense of Tripoli and "cleanse" it of rebel forces, warning they would be "enslaved" by Western powers if they fail. [Updated at 5:32 p.m. ET, 11:32 p.m. in Libya] A Libyan government spokesman said Sunday that some 1,300 people have been killed in fighting within the last 12 hours. "We expect the death toll to rise beyond anyone's imagination," Musa Ibrahim told reporters. [Updated at 5:30 p.m. ET, 11:30 p.m. in Libya] A Libyan government spokesman warned of humanitarian disaster and a "massacre" in Tripoli as rebel forces advanced into the capital Sunday, but said forces loyal to Gadhafi were holding off the attacks. Musa Ibrahim said Gadhafi's forces were being reinforced by volunteers coming into Tripoli and "can hold for much longer." But he acknowledged that rebel forces were pushing into the seaside capital, and told CNN that "a massacre will be committed in Tripoli if one side wins." He denied reports that Gadhafi's bodyguards had surrendered, but repeated calls for a halt to NATO airstrikes and urged peace talks. NATO for months has conducted airstrikes in Libya under a U.N. Security Council resolution authorizing force to protect Libyan civilians. [Posted at 5:28 p.m. ET, 11:28 p.m. Libya] Libyan rebel fighters have captured Saif al-Islam Gadhafi, the son of longtime strongman Moammar Gadhafi, a top rebel official said Sunday. The announcement from Ali Said, general secretary of the Benghazi-based Transitional National Council, came as rebel forces pushed into the Libyan capital with the support of NATO airstrikes. There was no immediate reaction from Libyan government officials to the report. Saif al-Islam Gadhafi emerged as a leading spokesman for his father in the early days of the revolt against Gadhafi's four-decade rule, which began with the seizure of Benghazi in February. He needs to arrange a rescue, helicopter style, but not only the journalists but the guards as well; who are stranded, probably without orders, in an untenable situation. Otherwise, they may serve as hostages or worse when these guys find themselves surrounded. No self enitixamaon of why us on the left supported Gaddafi? (At least by proxy through Tony Blair.)Huh? Yeah it's so great to see Libyan pleope cleaning up a part of Tripoli . You can feel the joy.